"I'm Yule, an apprentice Santa. Hey, a reindeer can be Santa too you know! Here, fly with me!" A reindeer fairy studying abroad in Tokyo, originally from the Tirnagog Gate. In the game's setting, Santa is not a single man, but an organization of many kind-hearted souls who take up the mantle for the sake of spreading happiness to the children of every realm; as a central hub connecting the various world, Tokyo was an ideal place for these people to gather and train future Santas. Yule was originally in training as a reindeer companion, who work as assistants to the Santas. Even so, he aimed higher, aspiring to become a Santa himself. Yule is accident-prone and a bit of a bumbler, but has nothing if not a talent for making others happy: He's the first to offer a smile and a supportive shoulder if he sees someone is feeling blue. To Yule, bringing joy to others is a joy in and of itself, and to become a Santa would be a dream job. However, many of the other apprentices see him as an upstart with ambitions above his station. It was only the intervention of the school's headmaster that granted him permission to take on the apprenticeship, and he respects and looks up to his benefactor a great deal. 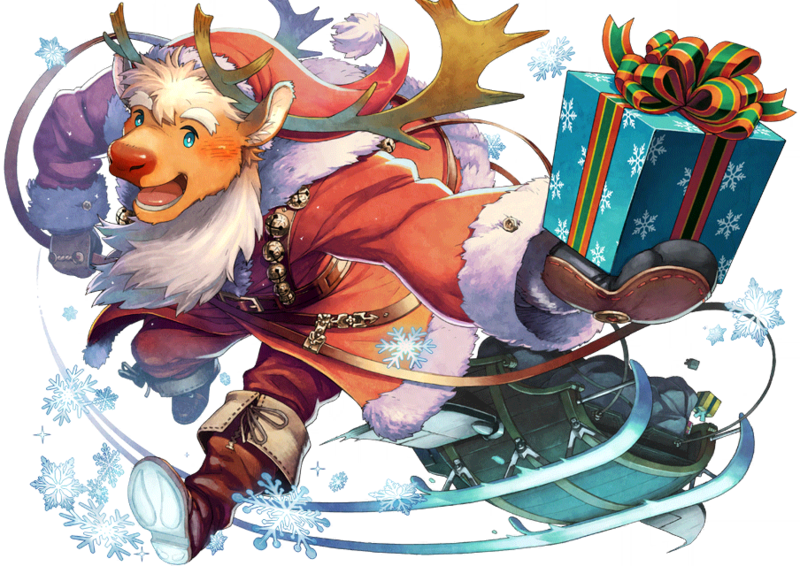 As a reindeer raised to be companion to Santa, he was given a magical sled that confers the gift of flight, a supreme power that defies even the bounds of gravity. Even as his schoolmates tell him that a reindeer can't be anything more than a reindeer, he persistently continues to fly toward his dream. "A fey reindeer Transient from the world of Tir na Nog who dreams of becoming a Santa Claus. In Tokyo, various Santas from various worlds have gathered at the academy he attends. They are currently receiving lessons on how to achieve that status. He's typically cheerful but has a nervous personality. Whenever he causes trouble and is laughed at by others, he falls into depression as soon as he is alone." "The Sled he owns contains the Rule of Gliding that allows him to slide through the air. Under the power of this Rule the air is a thing to be ascended, not to fall through is one of the best, allowing for complete disregard of gravity. He is perfectly suited to become one of Santa's reindeer still strives to become a Santa himself. He's hurt when people say that reindeer can only be reindeer but he continues to strive for his dream." I'm Yule, an apprentice Santa. Hey, a reindeer can be Santa too you know! Here, fly with me! Now, let's ride the sled! Flying through the snowy sky, The Holy Night's Delivery! Korvatunturi! Now, on to the next chimney. The children are waiting. I want you to ride the sleigh I pull. I'll be Santa, as will you of course. That's right, please be my only Santa. His name is likely a reference to Yule, a midwinter celebration of the Germanic peoples. Yule's Charge Skill Korvatunuri refers to the mountain of the same name, which is the location of Santa's workshop in Finnish folklore. 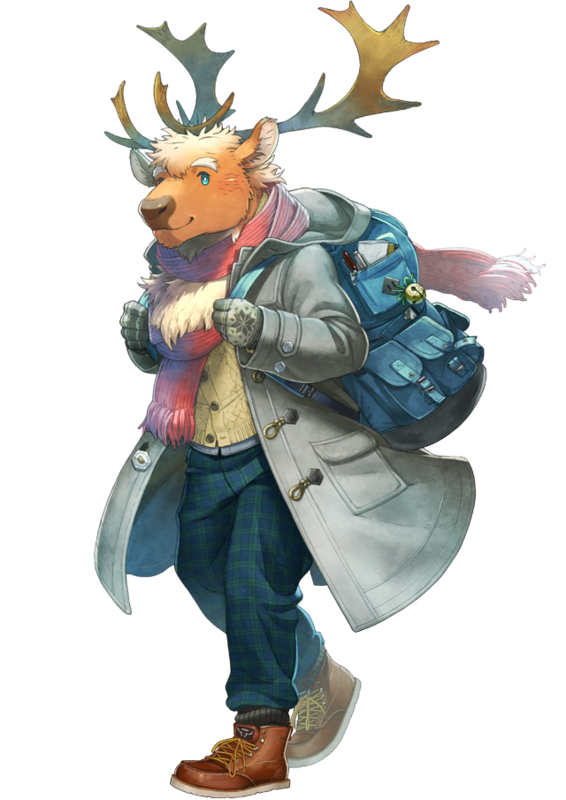 When he blushes, Yule's nose nose turns red as well as his cheeks, reminiscent of the Christmas character Rudolph, another reindeer who was outcast by his peers and faced adversity in pursuit of his dreams. He's only available during event shop. How exactly do you get Yule? Just from a summon? That's a constant that all event shop units share, Yule, Sitri, Zao, Benten, etc. My guess would be since they are practically guaranteed to have max SA level they up the cost slightly for a sense of balance. I want yule so bad. He's so cute!!! Why is that the 4 star Yule cost 2 more points than other 4 star characters, even when he is actually not much stronger than the others? I want another yule!! He's so damn cute!! !